When did bureaucracy become a dirty word? Almost certainly when the idea of adhocracy emerged. The two are polar opposites: radically different ways to co-ordinate an organisation. But, while the concept of bureaucracy goes back to the nineteenth century; adhocracy is new. But maybe not as new as you think. Why Do We Need Adhocracy? Organisations need to be… well, organised. But what organising structure is right for them? Over countless centuries, I guess we’ve tried just about everything. And probably many times in infinite variations. Well, not infinite, but you get the idea. And different structures suit different needs. Perhaps the most widely adopted, over the last couple of hundred years (the span of my memory! ), has been bureaucracy. A rigid and hierarchical arrangement of people holding fixed posts, administering people below them and, in turn, subject to the administration of people above them. Everyone has a job to do, a place in the structure, and somewhere to work. Once, the upper echelons each had their own office. In French, an office is a bureau. But that rigid and stable structure doesn’t suit every endeavour. So, with the rise of management and business thinkers in the twentieth century, we saw it come under challenge. And one of the alternative solutions is more temporary and readily adaptable to specific purposes. 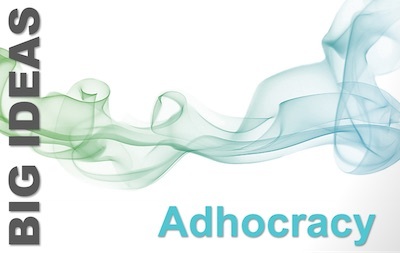 Ad hoc is the Latin tag which means ‘for this’ (purpose). We use it to describe something temporary, that we do or make for a particular task. Adhocracy is therefore literally rule for a specific purpose. A temporary structure for running a project is an adhocracy. But, increasingly, organisations are trying to make this flexible approach a new norm. A kind of permanent impermanence. The idea is to replace a rigid bureaucratic structure with a fluid and informal set of relationships. Most working definitions of adhocracy tend to define it in contrast to bureaucracy. They say more about what it is not, than what it is. So, I like Investopedia’s opening sentence. It captures as much about why it is of value as it does about what it is. The term ‘adhocracy’ was coined by none other than Warren Bennis. He predicted agile project teams within a loose structure: ‘adhocracy’. The term was then popularised by Alvin Toffler in his massive best seller, ‘Future Shock’. in that book, he envisaged flat organisational structures, with rapidly forming and re-forming project teams. He called these organisations ‘kinetic‘. In fact, he took Bennis and Slater’s ideas, and popularised them. But it was Henry Mintzberg, that great analyst of management work, who took the idea and gave it rigour. We’ll see how, below. In our Management Thinkers Series, Mintzberg and Bennis are two of the very few thinkers who got two articles. It is the second Mintzberg article in which we first discussed adhocracy. There is some information there that I have not repeated in this article. The first sign that a neologism is reaching wide acceptance is its move from capitalised to all lower case. So, in this light, take a look at this chart from Google’s Ngram viewer. This charts instances of the use of a word throughout the entire corpus of Google books. Mintzberg’s book had a far bigger impact than Toffler’s. 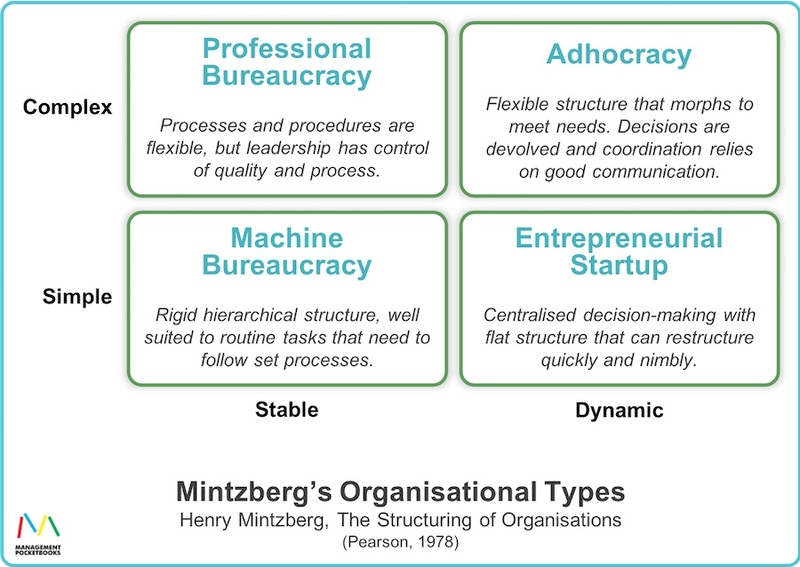 Peak Adhocracy was in 1983, with the publication of Mintzberg’s ‘Power in and Around Organizations’ (US|UK). From the mid 1980s, adhocracy becomes a mainstream concept and the word is no longer predominantly capitalised. The idea of adhocracy has settled down. It is now one of many management ideas we are discussing. The most ‘traditional-looking’ structure is the machine bureaucracy. It has a rigid hierarchical structure, well suited to routine tasks that need to follow set processes. There are rules to follow, and communication needs to follow a structure and to adhere to reporting lines. Decision-making is made at the top of the organisation, rather than devolved downwards. 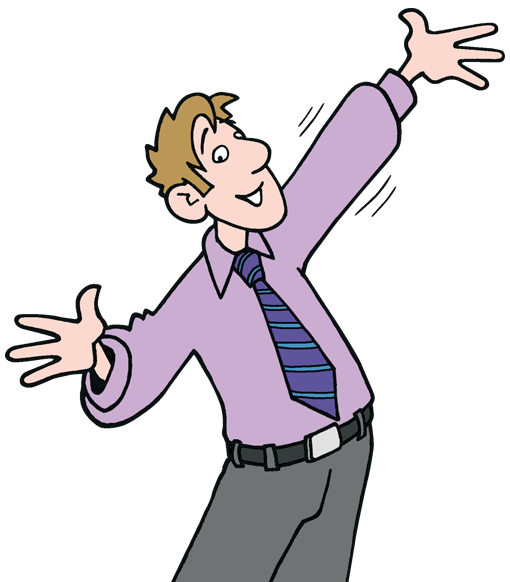 Professional managers at all levels rule the organisation, with their planning and standardisation. Here are your big manufacturing businesses like Honeywell and Toyota. What if the product isn’t a product; it’s a service? Processes and procedures need more flexibility, but the leadership will still want control of quality and process. This is Mintzberg’s professional bureaucracy. It’s my own background at professional services firm, Deloitte, and also lawyers and even Government departments. Sometimes, the world seems to be dominated by start-ups. These need to adapt and change quickly, so a rigid structure just won’t work. But the owners and investors want to stay in charge and make all the decisions. So, we see the entrepreneurial startup structure. It is centralised but able to restructure quickly and nimbly. Structures are often fairly flat, with only one or two layers between the CEO and the individual producers (often software developers). Projects come together, adopt whatever structure they need, and morph as the project evolves. There’s often a high degree of self-direction among highly competent team members. Co-ordination comes not through the structure, but by effective communication between people. In 1970, Toffler saw adhocracy as the way of the future. Well, we’re here now, nearly half a century on. And bureaucracies are proving remarkably resilient. Yes, there are examples of organisations applying the principles of adhocracy systemically, but they are rather few. And anyway, many of them are branding this with a new label: ‘holacracy‘. What is Your experience of Adhocracy? We’d love to hear your experiences, opinions, and questions. Please leave them in the comments below, and we will respond.